Dll4/Notch and Ephrin-B2/EphB4 pathways play critical roles in tumor vessel development and maturation. This study evaluates the efficacy of the inhibition of both signaling pathways, alone and in combination, in reducing the growth of an autochthonous mouse tumor and assesses potential adverse effects. We used the transgenic RIP1-Tag2 tumor model to study the effects of 1) inhibition of Dll4/Notch by either Dll4 allelic deletion or use of a soluble extracellular Dll4 (sDll4), 2) inhibition of Ephrin-B2/EphB4 signaling by a soluble extracellular EphB4 fused to albumin (sEphB4-Alb), and 3) inhibition of both pathways by sEphB4-Alb combined with either Dll4 allelic deletion or sDll4. To investigate adverse effects, we used inducible endothelial-specific Dll4 knock-out mice, treated with sEphB4-Alb, and carried out histopathological analysis. Dll4 allele deletion or soluble Dll4 treatment resulted in increased tumor vessel density, reduced mural cell recruitment and vessel perfusion which resulted in reduced tumor size. The soluble EphB4 instead reduced vessel density and vessel perfusion, leading to reduction of tumor size. Greater efficacy was observed when sEphB4-Alb was combined with either Dll4 allele deletion or sDll4 in regards to tumor size, vessel perfusion and mural cell recruitment. Induced endothelial specific Dll4 loss-of-function caused hepatic vascular alterations, which were prevented by concomitant sEphB4-Alb treatment. Combination targeting of Dll4/Notch and Ephrin-B2/EphB4 has potential for clinical investigation, providing cumulative efficacy and increased safety over Dll4/Notch inhibition alone. Targeting tumor angiogenesis, in particular through blocking vascular endothelial growth factor (VEGF) activity, has been successful, with several drugs now approved for use in many different cancer types . Rapid development of resistance to these , however, highlights the need for other vascular targeted therapies. Dll4/Notch pathway, which plays prominent role in angiogenesis, has become such a target. Dll4 is critical for embryonic vascular development and arterial specification and is markedly induced in murine and human tumor vessels [3–8]. Notch1 and Notch4 are also expressed in tumor vessels . Notch ligand expression and Notch activation is induced by VEGF [9, 10]. Dll4/Notch signaling in turn attenuates VEGF signaling, thus arresting endothelial cell proliferation, followed by recruitment of mural cells and vessel maturation [7–9, 11, 12]. Not surprisingly, targeted Dll4 allele deletion results in increased vascular proliferation but, unexpectedly, impaired vessel structure and function . Overall, inhibition of Dll4/Notch causes reduced tumor growth. Careful evaluation of the tumor vessels reveals increased vessel proliferation, reduced lumen size, reduced mural cell recruitment, increased leakiness and reduced perfusion. Furthermore, tumors resistant to VEGF targeted therapy remain responsive to Dll4/Notch inhibitors [7, 12]. Another ligand-receptor pair downstream from the VEGF and Notch pathways that plays a critical role in artery-vein endothelium specification is Ephrin-B2 and EphB4. Ephrin-B2 is specifically expressed in arterial angioblasts, endothelial cells, and perivascular mesenchymal cells, whereas EphB4 is expressed in endothelial cells belonging to the venous lineage only. Targeted disruption of either EphB4 or EfnB2 results in early lethality in the developing embryo as a result of arrested angiogenesis but not vasculogenesis [13–15]. On binding, the receptor and ligand on adjacent cells undergo dimerization and clusterization, activating forward and reverse signaling in receptor-expressing and ligand-expressing cells respectively to achieve vascular maturation. The monomeric form of the extracellular domain of EphB4 functions as an antagonist of EphB4-Ephrin-B2 signaling, thus blocking endothelial cell migration, tube formation and retards angiogenesis in tumor models [16, 17]. Fusion of this protein with albumin at the C-terminus (sEphB4-Alb) results in favorable pharmokinetics for clinical development. We chose to make use of the RIP1-Tag2 transgenic mouse model , wherein pancreatic islet carcinogenesis occurs secondary to the expression of the SV-40 large T-antigen (Tag) expression under the Rat Insulin Promoter (RIP). In this model, angiogenic islets become hyperplastic and dysplastic by week 5, and acquire angiogenic switch by week 10, progressing to adenomas (insulinomas) and invasive carcinomas . Predictable stepwise progression and angiogenic switch permits investigation of tumor angiogenesis and their inhibitors. This study was undertaken to test the activity of a Dll4/Notch inhibitor and an Ephrin-B2/EphB4 inhibitor, each alone and in combination. We studied the effects of Dll4 allelic deletion and of systemic administration of sDll4 on the tumor vasculature. In addition we studied the effect of sEphB4-Alb alone, in combination with sDll4 treatment or with Dll4 allelic deletion. The results validate the efficacy of each inhibitor alone and reveal for the first time that simultaneous inhibition of both pathways has greater efficacy. Furthermore, given the concerns related to potential toxicity caused by therapeutic blockade of Dll4 signaling , conditional Dll4 knockout mice were used to assess the impact of chronic endothelial specific Dll4 loss-of-function. This was observed to cause hepatic vascular alterations, as previously reported for pharmacological inhibition of Dll4/Notch signaling . Interestingly, these lesions were prevented by systemic Ephrin-B2/EphB4 inhibition, which provides an important advantage to this combination therapy. All animal-involving procedures in this study were approved by the Faculty of Veterinary Medicine of Lisbon Ethics and Animal Welfare Committee. The generation of Dll4 +/- (Dll4/LacZ) mice on CD1 background has been reported previously . The transgenic RIP1-Tag2 (RT2) mice of CD1 and C57/BL6 backgrounds, used for breeding with the Dll4 +/- line and in experimental drug trials, respectively, were provided by Dr. Oriol Casanovas. Dll4 conditional knockout mice (Dll4 lox/lox ) were generated as previously described  and crossed with VE-cadherin-Cre-ERT2 mice, a kind gift from Dr. Ralph Adams, to produce a tamoxifen-inducible endothelial-specific Dll4 loss-of-function line (Dll4 lox/lox Cre+). The animals were housed in well ventilated propylene cages with sawdust as bedding, in a room with controlled temperature between 22°C and 25°C and a 12-hours-light/12-hours-dark cycle. The mice were fed with standard laboratory diet and water ad libitum. From 12 weeks of age, all RT2 mice received 5% sugar in their water to relieve the hypoglycemia induced by the insulin-secreting tumors. To study the effects of impaired Dll4/Notch signaling on RT2 insulinoma growth, RT2 Dll4 +/+ and RT2 Dll4 +/- littermates (CD1 background, n = 8 for each group) were sacrificed for tumor measurement, histological analysis of vascular morphology and gene expression analysis at 13.5 weeks of age. The pancreas glands were dissected and the macroscopic tumors (≥1 × 1 mm) were excised. Tumor volume was calculated using the formula V = 0.52 × a × b 2 where a and b equal the longer and shorter diameter of the tumor, respectively. The volumes of all tumors from each mouse were added to give the overall tumor burden per animal. The effect of Dll4 allelic deletion in combination with Ephrin-B2/EphB4 signaling inhibition on the growth of the RT2 insulinoma was assessed by the administration of the soluble extracellular domain of EphB4 fused with albumin (sEphB4-Alb), which was produced as previously described . Both RT2 Dll4+/+ and RT2 Dll4+/- mice (CD1 background, n = 12 for each group) were separated in equal subgroups, treated intraperitoneally (i.p.) with vehicle (PBS) or sEphB4-Alb (10 mg/kg) 3×/wk for 3.5 weeks beginning at the age of 10 weeks and finally sacrificed for tumor measurement and histological analysis. In the therapeutical trials. we assessed the efficacy of a systemically administered Dll4/Notch-inhibitor, soluble Dll4 extracellular domain fused to Fc (sDll4), both alone and in combination with sEphB4-Alb. sDll4 was produced as previously described . Vehicle (PBS, i.p. 3×/wk), sDll4 (10 mg/kg/day, i.p., 3×/wk), sEphB4-Alb (10 mg/kg/day, i.p., 3×/wk), and the combination of sDll4 (10 mg/kg/day, i.p., 3×/wk) with sEphB4-Alb (10 mg/kg/day, i.p., 3×/wk) treatments were started when RT2 mice (C57BL6 background) reached the age of 10 weeks and continued until mice were 13.5 week-old. Two independent experiments involved 6 animals per treatment group. To evaluate the effect of Dll4 allelic deletion in combination with Ephrin-B2/EphB4 signaling inhibition on longevity, the RT2 Dll4 +/+ and RT2 Dll4 +/- mice were separated in two equal groups (n = 10 for each group), treated i.p. with vehicle (PBS) or sEphB4-Alb (5 mg/kg, 3×/wk), beginning at the age of 10 weeks and continuously monitored for signs of hypoglycemic shock. The mice were sacrificed if found moribund or if body weight loss exceeded 15%. Survival rate was calculated as the percentage of live mice at the end of each week relative to the initial number of animals in the experimental group. Heart, lung, liver, brain, kidney and intestines were collected from sDll4 and sEphB4-Alb treated mice used in the therapeutical trials, fixed in 10% formalin solution for 48 h, dehydrated in alcohol, cleared in xylene, embedded in paraffin, sectioned at 10 μm and stained with hematoxylin (Fluka AG Buchs SG Switzerland) and eosin Y (Sigma Chemicals, St. Louis, MO) to study eventual histopathological alterations. To assess the side effects that might arise from total (100%) inhibition of endothelial-specific Dll4 signaling, 8 week-old Dll4 lox/lox Cre+ (n = 10) were treated with tamoxifen (50 mg/kg daily for 5 days) to produce endothelial-specific Dll4 null individuals, while a group of 8 week-old Dll4 lox/lox Cre+ (n = 10) were left uninduced (control mice with constitutive Dll4 expression). Ten weeks later, the mice were sacrificed and heart, lung, liver, brain, kidney and intestines were collected, processed and examined as described above. Since Dll4 endothelial loss of function has been associated with hepatic lesions, we decided to determine the potential toxicological effect of a combination of Dll4/Notch and Ephrin-B2/EphB4 targeted therapy. Therefore another group of 8-week-old Dll4 lox/lox Cre+ (n = 10) were treated with tamoxifen (50 mg/kg daily) for 5 days, subsequently divided in two equal subgroups that were injected with vehicle (PBS) or sEphB4-Alb (10 mg/kg) for ten weeks and then sacrificed. Liver samples were processed and examined as described above. RT2 insulinomas obtained from tumor burden studies and therapeutical trials were fixed in a 4% paraformaldehyde (PFA) solution at 4°C for 1 h, cryoprotected in 15% sucrose, embedded in 7.5% gelatin, snap frozen in liquid nitrogen and cryosectioned at 10 and 20 μm. Double fluorescent immunostaining to the platelet endothelial cell adhesion molecule (PECAM) and the peri-vascular cell marker alpha smooth muscle actin (α-SMA) was performed on tissue sections to examine tumor vascular density and vessel maturity while double fluorescent immunostaining to PECAM and the pericyte marker neurogenin 2 chondroitin sulfate proteoglycan (NG2) was used to visualize pericyte recruitment. Rat monoclonal anti-mouse PECAM (BD Pharmingen, San Jose, CA), and rabbit polyclonal anti-mouse α-SMA (Abcam, Cambridge, UK) or rabbit polyclonal anti-mouse NG2 (Millipore, Billerica, MA) were used as primary antibodies. Species-specific secondary antibodies conjugated with Alexa Fluor 488 and 555 were from Invitrogen (Carlsbad, CA). Tissue sections were incubated with primary antibody overnight at 4°C and with secondary antibody for 1 hour at room temperature. Nuclei were counterstained with 4',6-diamidino-2-phenylindole dihydrochloride hydrate (DAPI; Molecular Probes, Eugene, OR). Fluorescent immunostained sections were examined under a Leica DMRA2 fluorescence microscope with Leica HC PL Fluotar 10 and 20X/0.5 NA dry objective, captured using Photometrics CoolSNAP HQ, (Photometrics, Friedland, Denmark), and processed with Metamorph 4.6-5 (Molecular Devices, Sunnyvale, CA). Morphometric analyses were performed using the NIH ImageJ 1.37 v program. Vessel density corresponds to the percentage of each tumor section field occupied by a PECAM-positive signal. As a measure of vascular maturity, vessel wall assembly was assessed by quantifying the percentage of PECAM-positive structures lined by α-SMA-positive coverage while pericyte recruitment was assessed by quantifying the percentage of PECAM-positive structures lined by NG2-positive coverage. To mark vessel perfusion, mice were anesthetized and biotin-conjugated lectin from Lycopersicon esculentum (100 μg in 100 μl of PBS; Sigma, St. Luis, MO) was injected via caudal vein and allowed to circulate for 5 minutes before the vasculature was transcardially perfused with 4% PFA in PBS for 3 minutes. Tumor samples were collected and processed as described above. Endothelial cells were stained with PECAM antibody and perfused vessels were visualised by streptavidin-Alexa 488 (Invitrogen, Carlsbad, CA), which binds to biotinylated lectin. The images were obtained and processed as described above. Tumor perfusion was quantified by determining the percentage of PECAM-positive structures that were colocalized with Alexa 488 signals. Tumors from sEphB4-Alb or PBS treated RT2 Dll4 +/+ mice were harvested at week 13.5. RNA was then isolated and used for global gene expression analysis with Illumina MouseRef-8 v2.0 Expression BeadChip (Illumina, San Diego, CA). The genearray data were deposited to NCBI-GEO database http://0-www.ncbi.nlm.nih.gov.brum.beds.ac.uk/geo/query/acc.cgi?acc=GSE24603. Genes with expression change between two groups higher than 2 fold and P value smaller than 0.05 were selected and the changes were validated by quantitative RT-PCR. Using a SuperScript III FirstStrand Synthesis Supermix (Invitrogen, Carlsbad, CA), first-strand cDNA was synthesized from total RT2 Dll4 +/+ and RT2 Dll4 +/- insulinoma RNA. Real-time PCR analysis was performed as described  using specific primers for β-actin, GAPDH, PECAM, Dll4, Hey2, VEGF-A, VEGFR1, VEGFR2, VEGF-C, VEGFR3, PDGF-β, Ephrin-B2, and Tie2. Primer pair sequences are available on request. Gene expression was normalized to β-actin and GAPDH. Data processing was carried out using the Statistical Package for the Social Sciences version 15.0 (SPSS v. 15.0; Chicago, IL). Kaplan-Meier product-limit estimation with Breslow generalized Wilcoxon test was used for survival analyses. All other statistical analyses were performed using the Mann-Whitney-Wilcoxon test. All results are presented as mean ± SEM or mean ± SD when more appropriate. P-values < 0.05 and <0.01 were considered significant (indicated in the figures with *) and highly significant (indicated with **), respectively. To assess the effect of impaired signaling through the Dll4/Notch pathway in an autochthonous tumor model, we crossed RT2 transgenic mice with Dll4 +/- mice and compared tumor burden between RT2 Dll4 +/+ and RT2 Dll4 +/- offspring. The two groups were humanely sacrificed at 13.5 weeks of age. Average tumor numbers per mouse were similar in RT2 Dll4 +/+ and RT2 Dll4 +/- littermates (Figure 1A). In contrast, a significant decrease in tumor growth was observed in RT2 Dll4 +/- mice when compared to the RT2 Dll4 +/+ control group. On average, RT2 Dll4 +/- insulinoma volume and overall tumor burden, calculated as a sum of tumor volumes per mouse, were reduced by approximately 50% compared to the control animals (Figure 1A). Dll4 allelic deletion reduced tumor burden in RT2 mice due to increased nonproductive tumor angiogenesis. A, Number of tumors per animal, average tumor volume and overall tumor burden, are calculated as the sum of tumor volumes per mouse, in RT2 Dll4 +/+ (n = 8) and RT2 Dll4 +/- (n = 8) mice. 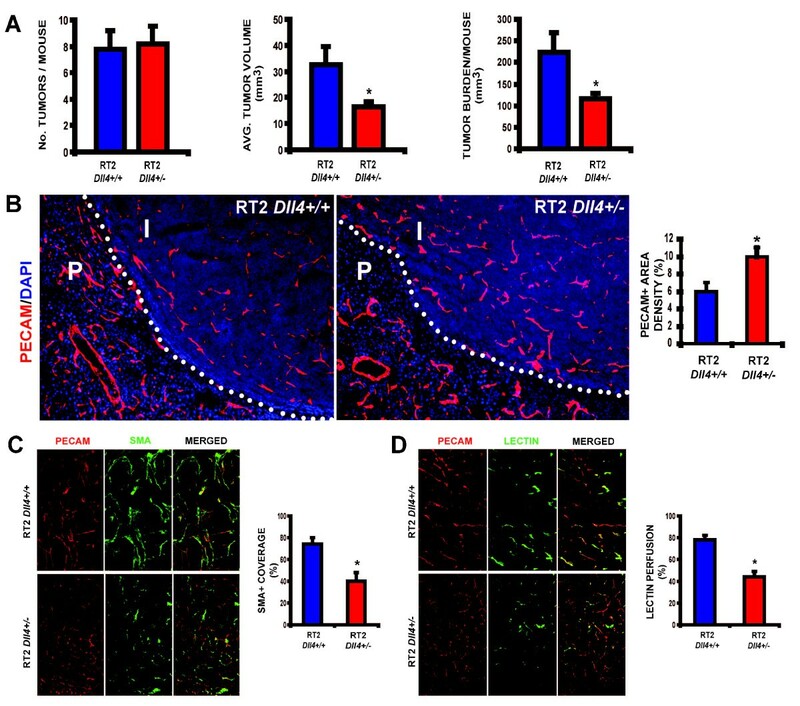 B, Vascular response examined in RT2 Dll4 +/+ (n = 5) and RT2 Dll4 +/- (n = 5) insulinomas by PECAM immunostaining. RT2 Dll4 +/- mice showed reduced vessel calibers, increased sprouting, branching irregularities, and network disorganization (left). Dotted lines mark tumor border. I indicates insulinoma while P indicates normal pancreatic tissue surrounding the tumor. Vascular density was estimated as percentage of PECAM-positive area per tumor section surface and presented for two experimental groups (right). C, Mural cell coverage on newly formed vessels was examined by double staining of PECAM and α-SMA. SMA-positive cells lining PECAM-positive endothelium were profoundly reduced in RT2 Dll4 +/- insulinomas (left). The percentage of PECAM-positive structures covered by SMA-positive area was measured as an indicator of vessel maturation (right). D, Tumor vessel competence evaluated by lectin perfusion. Simultaneous staining of endothelial cells with PECAM and visualization of perfused vessels demonstrate a reduction in the fraction of perfused vessels in RT2 Dll4+/- vs. RT2 Dll4+/+ mice (left). The percentage of PECAM-positive area co-localized with lectin was measured to estimate the proportion of functional vessels within insulinomas (right). The two group values for each parameter were statistically analyzed using Mann-Whitney-Wilcoxon test. Error bars represent SEM. * P < 0.05 was considered significant. We also examined the vascular morphology of tumors derived from both RT2 Dll4 +/+ and RT2 Dll4 +/- mice at week 13.5. Tumor endothelium was visualized by immunostaining of PECAM while PECAM/α-SMA co-localization was used to evaluate mural cell recruitment and thereby vessel maturity. In addition, subgroups of RT2 Dll4 +/+ and RT2 Dll4 +/- mice were perfused with endothelium-binding lectin to visualize the perfused regions of the tumor vasculature. The RT2 Dll4 +/+ tumors had irregular vessel formation and absence of a distinct branching pattern (Figure 1B) as well as a high degree of vessel maturity with a mean α-SMA-positive cell coverage of approximately 75% (Figure 1C). Furthermore, the lectin-perfusion study indicated that nearly 80% (78 ± 4%) of the vessels displayed appropriate lumen formation and were perfused (Figure 1D). In comparison, RT2 Dll4 +/- insulinoma showed a 1.8-fold increase in the density of PECAM-positive areas (p < 0.05) and formed atypical networks lacking vessel hierarchy or symmetry but displaying pronounced branching and multiple interconnections (Figure 1B). 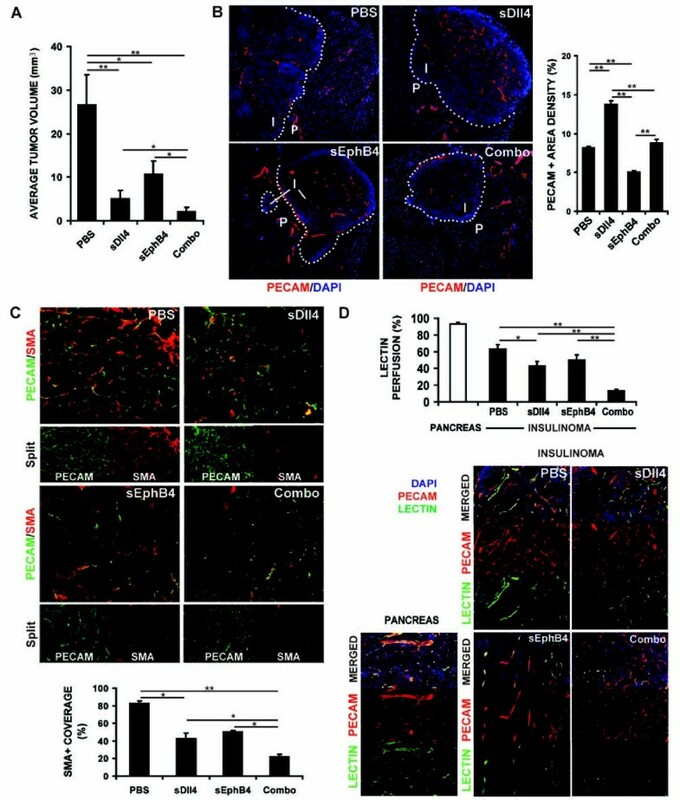 The number of α-SMA-positive cells lining PECAM-positive endothelial cells was greatly reduced (45% reduction, p < 0.05, Figure 1C). As anticipated, a significant reduction in the proportion of functional vessels was demonstrated by lectin-perfusion (2-fold decrease, p < 0.05, Figure 1D). Quantitative RT-PCR was used to analyze RT2 Dll4 +/+ and RT2 Dll4 +/- tumors for putative differences in the expression of genes known to be involved in physiological and tumor angiogenesis (Figure 2). Relative to Dll4 +/+ insulinomas, Dll4 +/- tumors showed an approximately 50% reduction in Dll4 mRNA levels, as expected, as well as reduced Hey2 expression, consistent with a reduction in Notch signaling. Furthermore, there was increased Vegf-a expression and an over 8-fold increase in the VEGFR2/VEGFR1 ratio in the Dll4 +/- tumors. Similarly, both Vegf-c and Vegfr3 were up-regulated in these tumors. In addition, there was an increase in PDGFR-β, and decrease in Ephrin-B2 and Tie2 mRNA levels. The RNA level of PECAM was not significantly increased (1.2 fold), different from 40% increase of the PECAM signal in Figure 1B. One explanation is that quantitative PCR was done in whole tumor tissue and not microdissected vessels, which likely resulted in failure to document PECAM modulation in mRNA level. Differential gene expression in RT2 Dll4 +/+ vs. RT2 Dll4 +/- insulinomas. Total RNA was isolated from harvested insulinomas (2-3 tumors/mouse, n = 5 for each genotype) and gene expression analysis of tumor tissues was performed by quantitative RT-PCR for indicated genes involved in angiogenesis. Gene expression levels were normalized to β-actin levels. Error bars represent SD. sEphB4-Alb has been shown to be a potent inhibitor of tumor angiogenesis by blocking Ephrin-B2 and EphB4 signaling. To examine the effect of sEphB4-Alb in the RT2 system, RT2 mice were treated with sEphB4-Alb or PBS for 3.5 weeks beginning at 10 weeks of age. At 13.5 weeks of age, sEphB4-Alb treated RT2 mice showed reduced mean tumor volumes relative to PBS-treated control mice by approximately 50% (p < 0.05) (Figure 3A). At this point tumors were harvested and RNA was isolated and used for global gene expression analysis. Genes with expression changes between the two groups higher than 2-fold and P value smaller than 0.05 are shown in Table 1. Selected genes with known role in vascular biology were evaluated by quantitative RT-PCR for validation studies. Of these genes, Rgs5 and Psenen are of special interest. They are upregulated in sEphB4-Alb treated group compared to the untreated wild type mice and their changes were validated by quantitative RT-PCR (supplementary Figure 1A). 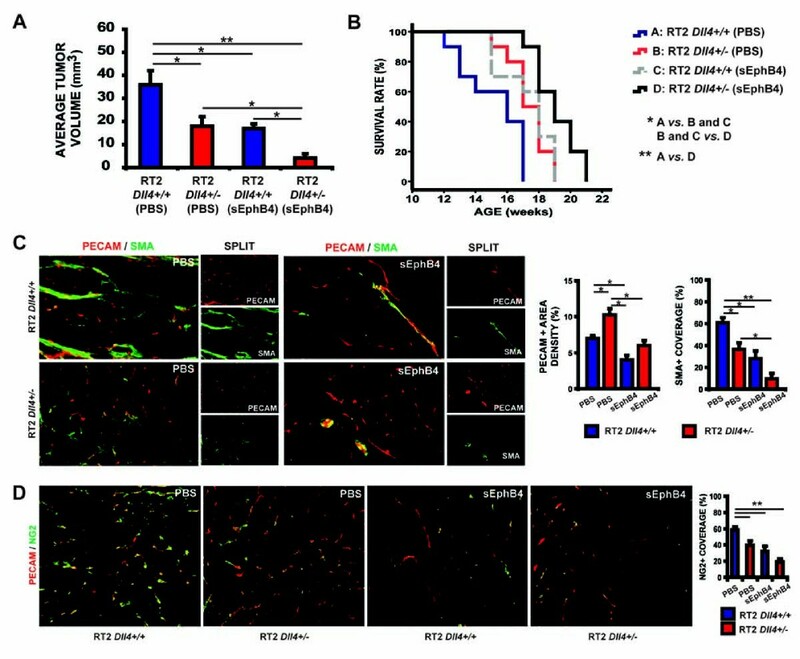 Rgs5 is a marker of pericytes and is a negative regulator of pericyte maturation. Rgs5 was also upregulated in umbilical artery smooth muscle cell co-cultured with human umbilical artery endothelial cell when treated with sEphB4-Alb (Additional file 1. Psenen is a critical component of presenilin complex that is required for Notch receptor processing. sEphB4-Alb inhibited insulinoma growth and extended longevity in RT2 Dll4 +/+ and Dll4 +/- mice. A, Average tumor volumes developed by 13.5-week old RT2 (Dll4 +/+ or Dll4 +/- ) male mice previously treated for 3.5 weeks with drug vehicle (PBS) or sEphB4-Alb (10 mg/kg). All the groups had 6 animals and were treated i.p. 3 times a week. B, Survival rates in RT2 Dll4 +/+ and RT2 Dll4 +/- treated with vehicle (PBS) or sEphB4-Alb (5 mg/kg). All the groups had 10 animals and were treated i.p. 3 times a week. Survival rate was calculated as the percentage of live mice at the end of each week relative to the initial number of the animals per experimental group. C, Sections of tumors harvested at the end of the experiment mentioned in A were co-stained with anti-PECAM (red) and anti-α-SMA (green) as described in Fig. 1C. D, Sections of tumors harvested at the end of the experiment mentioned in A were co-stained with anti-PECAM (red) and anti-NG2 (green). The percentage of PECAM-positive structures covered by NG2-positive area was measured as a parameter of pericyte recruitment (right). Kaplan-Meier product-limit estimation with Breslow generalized Wilcoxon test was used for survival analyses. Other data were analyzed using Mann-Whitney-Wilcoxon test. Error bars represent SEM. * P < 0.05 and ** P < 0.01 were considered significant and highly significant, respectively. To examine whether synchronous suppression of Dll4/Notch and EphB4/Ephrin-B2 signaling pathways might result in greater inhibition of RT2 tumor development, we treated RT2 Dll4 +/- mice with sEphB4-Alb. The reduction of the average tumor volume was even more pronounced in sEphB4-Alb treated RT2 Dll4 +/- group (approximately 90% reduction, p < 0.01) where Dll4/Notch and Ephrin-B2/EphB4 signaling were simultaneously inhibited (Figure 3A). To test whether these tumor-suppressive effects are reflected on longevity, both Dll4 +/+ and Dll4 +/- RT2 mice were treated with PBS or half dose of sEphB4-Alb (5 mg/kg) beginning at 10 weeks of age and continuously monitored for survival benefit estimation. Dll4 allelic deletion just as sEphB4-Alb treatment were found to extend the mean lifespan of RT2 mice by 2 weeks (15 ± 1 wk in PBS treated RT2 Dll4 +/+ versus 17 ± 1 wk in PBS treated RT2 Dll4 +/- and sEphB4-Alb treated RT2 Dll4 +/+ mice, p < 0.05 Figure 3B). Significantly, an additional survival benefit of 2 weeks, on average, was provided by combinatorial Dll4/Notch and Ephrin-B2/EphB4 inhibition (15 ± 1 wk in PBS-treated RT2 Dll4 +/+ versus 19 ± 1 wk in sEphB4-treated RT2 Dll4 +/- , p < 0.01, Figure 3B). Histologicaly, microvessel density assessed by immunostaining of PECAM was significantly increased in PBS treated Dll4 +/- tumors compared to PBS treated Dll4 +/+ insulinomas, while sEphB4-Alb treatment in RT2 Dll4 +/+ mice caused a statistically significant decrease of tumor vessel density (Figure 3C). Notably, in both PBS treated Dll4 +/- tumors and sEphB4-Alb treated RT2 Dll4 +/+ tumors, average vessel caliber was reduced, and pericyte recruitment and vessel wall formation were markedly impaired, as indicated by PECAM/NG2 and PECAM/α-SMA immunostaining (Figure 3C and 3D). Furthermore, the simultaneous suppression of Dll4/Notch and Ephrin-B2/EphB4 signaling in sEphB4-Alb treated RT2 Dll4 +/- mice drastically reduced the vessel diameters and their mural cell coverage, even though the total PECAM-positive area apparently similar to PBS-treated Dll4 +/+ insulinomas (Figure 3C and 3D). Therefore, combinational targeting Dll4/Notch signaling EphrinB2-EphB4 has greater efficacy in blocking vessel maturation and perfusion of the tumor. sDll4 is a potent inhibitor of Notch signaling and has been shown to reduce tumor growth in various tumor models [7, 8, 21]. We sought to determine the effect of combined blockade of Dll4/Notch pathway (by sDll4) and Ephrin-B2/EphB4 pathway (by sEphB4-Alb) on tumor angiogenesis. RT2 mice were treated from 10 to 13.5 weeks of age. Compared to control mice treated with the vehicle (PBS), tumor volumes were reduced in both sDll4 treated (81% reduction, p < 0.01) and sEphB4-Alb treated animals (60%, p < 0.05). As presented in Figure 4A, the combination therapy caused an even more significant tumor suppression (92%, p < 0.01), which has significant difference when compared to the therapy with sDll4 or sEphB4-Alb alone (p < 0.05). Combination therapy of sDll4-Fc and sEphB4Alb inhibits RT2 tumor growth with greater efficacy than either molecule alone. A, Average tumor volumes developed by 13.5-week old RT2 male mice previously treated for 3.5 weeks with drug vehicle (PBS, i.p. 3×/wk, control group), sEphB4-Alb (10 mg/kg i.p., 3×/wk), sDll4-Fc (10 mg/kg i.p. 3×/wk), or combination of sEphB4-Alb and sDll4-Fc (10 mg/kg, i.p. 3×/wk for both). The results were obtained from two independent trials involved 6 animals per treatment group and per trial. B, Sections of tumors harvested at the end of the experiment mentioned in A were immunostained with PECAM (red) and DAPI (blue) as described in Fig. 1B. C. Sections of tumors harvested at the end of the experiment mentioned in A were stained as described in Fig. 1C. D, Tumor vessel functionality evaluated by lectin perfusion as described in Fig. 1D. Perfusion in normal pancreas tissue was also analyzed and shown on the bottom left. The data were analyzed using Mann-Whitney-Wilcoxon test. Error bars represent SEM. * P < 0.05 and ** P < 0.01 were considered significant and highly significant, respectively. Harvested tumors were double immunostained for PECAM/α-SMA to analyze microvessel density and maturity and PECAM/lectin to estimate tumor perfusion and vessel functionality (Figure 4B-D). Compared to PBS treated group, sDll4 treated tumors showed an increase in total tumor vessel density of 41% on average (p < 0.01), reduced mural cell coverage of 47% (p < 0.05), and reduced lectin perfusion of 32% (p < 0.05) sEphB4-Alb treatment in contrast caused reduced microvessel density (39% reduction, p < 0.01), pericyte recruitment (39%) and lectin perfusion (21%). Finally, the small sized tumors observed in mice treated with both sDll4 and sEphB4-Alb were characterized by decreased vessel diameters (Figure 4B) and markedly impaired vessel maturation with 73% reduction in mural cell coverage compared to PBS-treated insulinomas (p < 0.01) (Figure 4C). Meanwhile, lectin perfusion was drastically decreased (79%, p < 0.01) (Figure 4D). These results indicate that sDll4/sEphB4-Alb combination therapy has at least a cumulative effect on minimizing tumor vessel competency and blood delivery to neoplasic cells, consequently reducing tumor growth. Chronic Dll4 blockade results in benign vascular proliferative lesions in the liver . In contrast, Dll4 haploinsufficiency and intermittent administration of sDll4 (3 times a week for 3.5 weeks) in RT2 mice significantly reduced tumor growth, but did not cause any vascular lesions in the liver or other vital organs such as heart, brain, lung, kidney, and intestine (data not shown). To confirm if complete and persistent loss of Dll4 causes organ toxicity, we used a conditional, endothelial-specific Dll4 knock-out mouse line (Dll4 lox/lox Cre+), in which Dll4 deletion is dependent on tamoxifen administration. Comparative histological analyses were performed with cardiac, cerebral, pulmonary, renal, intestinal and hepatic samples obtained from mice 10 weeks after tamoxifen-induction or vehicle (PBS)-administration. While control animals presented normal organ histology, the endothelial Dll4 knock-out mice showed alterations in liver architecture. 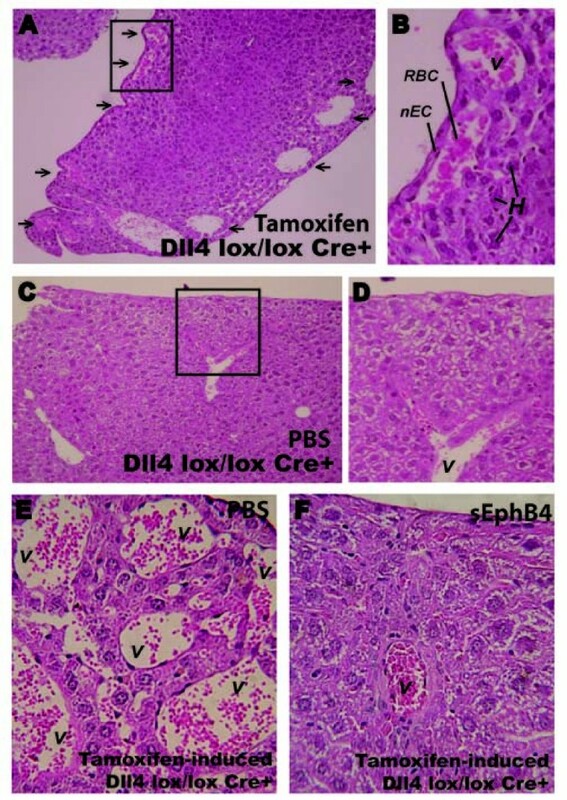 Macroscopically, the liver surface of tamoxifen-induced Dll4lox/lox Cre+ mice had a characteristic micro-nodule. Although general lobular architecture and portal spaces were preserved, we observed some areas with markedly dilated sinusoids. However, the most prominent feature was excessive subcapsular vessel proliferation with a few hemangioma-like structures (Figure 5A and 5B). To assess whether and to which extent these alterations can be influenced by concomitant Ephrin-B2/EphB4 inhibition, we treated tamoxifen-induced Dll4lox/lox Cre+ mice with PBS or sEphB4-Alb (10 mg/kg). While PBS treated mice developed previously described subcapsular vascular alterations (Figure 5E), sEphB4-Alb treated animals showed a few dilated sinusoids but no evidence of vascular proliferative lesions (Figure 5F). Hepatic vascular lesions observed in endothelial-specific Dll4 knock-out mice are prevented by sEphB4-Alb administration. Representative pictures of hematoxylin and eosin staining of liver sections from induced, tamoxifen-treated (A and B) and non-induced, PBS-treated (C and D) Dll4 lox/lox Cre+ mice, and from induced, tamoxifen-treated Dll4 lox/lox Cre+ mice administered with PBS vehicle (E) or sEphB4-Alb (F) for 12 weeks to assess the effect of Ephrin-B2/EphB4 blockade combined with total inhibition of Dll4/Notch endothelial signaling. A, Ten weeks after the induction of endothelium-specific Dll4 loss-of-function, all studied 14-week-old Dll4 lox/lox Cre+ presented excessive sub-capsular vascular proliferation. The image shows vessels (arrows), some of which extremely dilated, occupying sub-capsular regions throughout the liver. B, Higher magnification of sub-capsular blood vessels (inset in A); C, Age-matched non-induced Dll4 lox/lox Cre+ presented normal liver histology. D, Higher magnification of the inset in C showing a single hepatic vessel that cannot be considered sub-capsular. E and F, Excessive vascular proliferation forming an hemangioma-like sub-capsular structure in a tamoxifen-induced Dll4 lox/lox Cre+ mouse injected with PBS and normal hepatic structure in a sEphB4-treated tamoxifen-induced Dll4 lox/lox Cre+ mouse, respectively. V, blood vessel; nEC, endothelial cell nucleus, RBC, red blood cells; H, hepatocytes. Dll4 allelic deletion or sDll4 treatment reduces the rate of tumor growth in this spontaneous model of insulinoma in the pancreas, while the number of tumors per mouse were unchanged, indicating that the transforming event caused by SV40 large T antigen under insulin promoter is independent on Dll4/Notch pathway, while the tumor growth is promoted by the expression of Dll4 in the vasculature. Similarly, sEphB4-Alb, which blocks Ephrin-B2 mediated forward signaling in venous endothelial cells through its cognate receptors, in particular EphB4, and reverse signaling in the arterial endothelial cells expressing Ephrin-B2, reduces the rate of tumor growth without affecting the number of oncogenic tumor nodules in the pancreas. Combination of sEphB4-Alb and sDll4 had a greater tumor inhibition efficacy than each one alone. This novel finding indicates that the activity of both pathways is non-overlapping even though Dll4/Notch signaling induces Ephrin-B2 [22–24]. The lack of overlapping effects is consistent with the fact that Dll4 targeted therapy has a markedly increased number of tumor vessels while sEphB4-Alb therapy results in significantly reduced tumor vessel density. Inhibition of Dll4-Notch signaling leads to induction of VEGF, probably through hypoxia. Meanwhile, there is also an increase in VEGFR2 level, resulting in a positive loop leading to enhanced VEGF signaling and thus increased vascular density. In addition, VEGFR3 is induced in insulinomas of Dll4 +/- RT2 mice compared to the Dll4 +/+ RT2 littermates. VEGFR3 expression in nascent vessels in addition to lymphatic endothelium may thus also have contributed to the enhanced vascular response. sEphB4-Alb mediated inhibition of Ephrin-B2/EphB4 signaling also results in areas of hypoxia in the tumor and increased expression of VEGF and Dll4 , which support the combined use of Ephrin-B2, VEGF, and Dll4 inhibitors. However, sEphB4-Alb treatment leads to fewer tumor blood vessels, suggesting that inhibition of Ephrin-B2/EphB4 pathway may reduce VEGF signaling even though VEGF level is increased. This can be explained by the recent findings that Ephrin-B2 controls internalization and signaling of VEGFR2 and VEGFR3 [25, 26]. VEGF receptor expression and internalization (trafficking), rather than the VEGF level, determine the net endothelial response. Concomitant inhibition of these two signaling systems results in vessel density below the controls, suggesting that reduction of VEGF signaling by Ephrin-B2/EphB4 inhibition partially overcomes the VEGF/VEGFR2 activation resulting from Dll4/Notch blockade. More importantly greater anti-tumor efficacy of combined therapy may result from markedly reduced vessel perfusion and maturation. Interestingly, sEphB4-Alb treatment induces the expression of PSENEN, a critical component of gamma-secretase presenilin complex . Presenilin complex is responsible for the cleavage of Notch receptor to release Notch intracellular domain, thus is required for activation of Notch signaling . Significance of PSENEN modulation in response to sEphB4-Alb is not known at present. In Dll4 +/- mice or sDll4 treated mice, the defects in vessel maturation may be in part be explained by the impaired Notch3 signaling, which is critical for mural cell function [29, 30]. Moreover, one critical step of vessel maturation, the recruitment of mural cells to the newly forming vessels, is known to be regulated by Ephrin-B2, PDGFRβ/PDGF-B, Tie-2, and Sphingosine-1 phosphate [31–34]. We thus examined these factors after Dll4/Notch inhibition. Surprisingly, increased PDGFR-β levels were identified in RT2 Dll4 +/- vs. RT2 Dll4 +/+ insulinomas even though there was a prominent reduction in mural cell recruitment to the vessels. We believe that defective recruitment results in a feedback increase in PDGFR-β. Angiopoietin receptor Tie2 [35, 36] as expected was decreased in Dll4+/- compared to Dll4+/+ insulinomas. The impaired mural cell recruitment upon Dll4/Notch inhibition may also be explained by the reduced Ephrin-B2 level. Ephrin-B2 is critical for the recruitment of mural cells to nascent vessels and its absence leads to vessel dilation and bleeding [14, 37]. In this study, sEphB4-Alb significantly impaired the recruitment of mural cells to blood vessels. The global gene expression analysis identified Rgs5 is upregulated upon sEphB4-Alb treatment both in vivo and in co-cultured smooth muscle cells and endothelial cells. Rgs5 is a pericyte specific marker. Knockout of Rgs5 in mice promotes the maturation of pericytes and normalization of tumor vessels . Rgs5 is also a novel HIF-1-dependent, hypoxia-induced gene that is involved in the induction of endothelial apoptosis . Therefore, upregulation of Rgs5 is consistent with the decreased vascular density and paucity of pericyte recruitment after sEphB4-Alb treatment which results in immature and non-functional vessels. Finally, in addition to improved anti-tumor efficacy, simultaneous blockade of Dll4/Notch and Ephrin-B2/EphB4 abolished the liver vascular lesions seen when only Dll4/Notch is inhibited . sEphB4-Alb blocks this toxicity, consistent with the reduced vascular response upon Ephrin-B2/EphB4 inhibition. Thus, Ephrin-B2/EphB4 blockade combined with Dll4/Notch inhibition provides greater safety and improved efficacy. In summary, targeting of Dll4/Notch and Ephrin-B2/EphB4 in combination showed marked improvement in tumor growth inhibition. This is primarily through modulation of vascular response in which impaired vessel maturation leads to poor perfusion. Complementary to improved efficacy, combination of sEphB4-Alb with Dll4/Notch inhibition appears to prevent excessive vascular proliferation in the liver, which is seen in extended Dll4/Notch blockade alone. Therefore, this combination is a potential candidate for cancer therapy. We thank Dr Oriol Casanovas for the RT2 mouse line, Dr Ralf Adams for the VE-cadherin-Cre-ERT2 mouse line and Dr Hugo Pissarra for histopathological evaluation of hepatic samples. This work was supported in part by the U.S. National Cancer Institute (RO1 CA 079218-07 to P.S.G.) and the Portuguese Science and Technology Foundation (POCTI/CVT/71084/2006 to A.D.). DD, JG, MB, and AT carried out the animal studies and immunostaining. XL performed analysis of gene array. MG carried out the validation of gene array results. LS performed liver toxicity analysis. VK and RL produced the therapeutic proteins for animal studies. AD and PSG designed and coordinated the studies. DD, AD, PSG, and RL prepared the manuscript. All authors read and approved the final manuscript.